The Neptune GTX is a multipurpose suit for multitalented women. Cruising the streets, adventuring round the world, commuting or doing it all, the Neptune GXT jacket is ready for any job you put it up to. In pouring rain and dropping temperatures, the GORE-TEX® membrane together with the thermal liner keeps you warm and dry. In oppressive sun and rising temperatures, the amply ventilated outer shell helps you keep your cool. 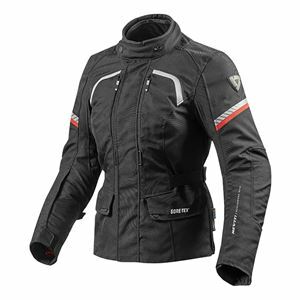 Manage the extremes and everything in between in comfort with the Neptune GTX Ladies jacket. Safety is assured with the CE-level 2 protectors, laminated reflection and high density outer shell.